We all know that Brad Meltzer had this weird idea that, by rewriting older stories to add "modern" cynicism and controversial themes, he was "saving the Silver Age" stories. We also get that such a stance is silly, as the Silver Age doesn't NEED saving, as there is nothing WRONG with the stories he is trying to "save." They are good stories on their own. However, Brad Meltzer was not the first writer to do this, not by a long stretch of the imagination. Today, let us examine how, in 1983, Dan Mishkin and Gary Cohn decided to "save the Silver Age" as well. In 1983, Dan Mishkin and Gary Cohn had been writing a variety of DC titles for a few years, mainly backups in other titles or fill-in issues. Mishkin was writing Wonder Woman by himself at the time as the regular writer, and the two had just launched the acclaimed Amethyst comic book the same month that they wrote the comic I am discussing today, DC Comics Presents #57. Please note that I have enjoyed a good deal of Mishkin and Cohn's work, and I do not think that they are bad writers at all. This issue, however, is a different story. 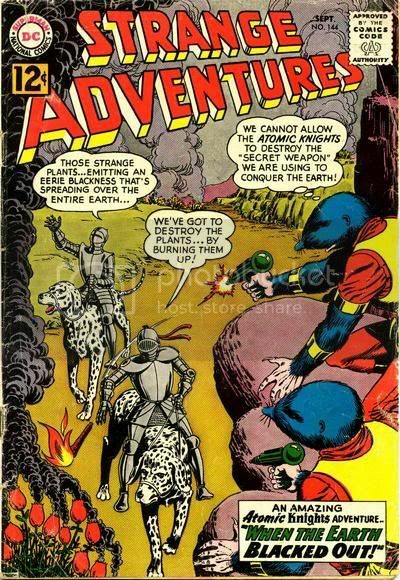 The Atomic Knights first appeared in the Julius Schwartz-edited title, Strange Adventures, in 1960's #117. The series was about a group of men, led by former Army Sergeant Gardner Grayle, who lived in a post-nuclear war America (1986 was the year of the great nuclear war). Donning suits of armor that were radiation-proof, Gardner and his allies travelled the country doing good deeds. The series was quite popular, and the creative team of John Broome and Murphy Anderson gave readers many fun adventures, finally ending in 1964. The crew made a couple of appearances in a couple of issues of ANOTHER post-nuclear war environment, Hercules Unbound in the 70s, but that was pretty much it. Well, as the ACTUAL year 1986 got closer, Cohn and Mishkin decided it was a good time to revisit this classic science-fiction tale, and, in the words of Meltzer, "save it." Of course, like Meltzer, their idea of "saving" meant taking the story and twisting it into something quite cynical. In DC Comics Presents #57, Superman is haunted with dreams of a post-nuclear war environment. Meanwhile, a computer glitch almost begins an ACTUAL nuclear war by convicing American computers that the USSR had launched an assault. 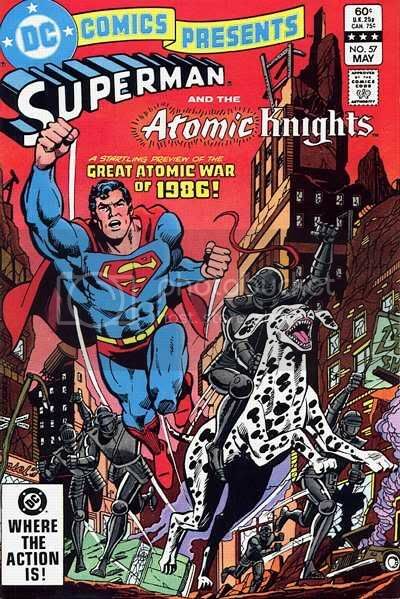 Then Superman wakes up in the post-apocalyptic world of the Atomic Knights!! Eventually, the mystery is revealed - Sgt. Gardner Grayle is in a state of suspended animation, while his brain is present in a world of his imagination. This world, as you may have guessed, is the land where the stories of the Atomic Knights took place. His love interest, Marene Herald, is based on the scientist who studied him as part of the project (and then had her memory wiped, so she could not tell anyone about the experiment). The whole thing was a study to see how soldiers would react to nuclear war, so to prepare them for future battle. Of course, Gardner instead used his mind (apparently, he was a mutant of some sort) to take control of the virtual reality world, and make it into an uplifting story of triumph in the face of adversity. A story about the indomnitable human spirit. This, of course, is mocked the entire comic. His love interest? Her brother in the story is just Grayle's mind twisting the fact that his friend Doug Herald is not Marene's BROTHER in real life. He is her HUSBAND. While Superman is trapped in the virtual reality world, he makes plenty of comments about how ridiculous the concept of the Atomic Knights is. Stuff like, "What? A monster like that could never mutate THAT much due to radiation!" What is Superman, the buzzkill police? Did he say that to Spider-Man in the Superman/Spider-Man crossover? "What? Powers from a radioactive spider? That is absurd! That could not happen! That makes no sense! Now, on the other hand, me flying? That makes perfect sense! How can I fly? Your yellow sun! It's as plain as day! Why does it give me the power of flight? It just does! And it makes perfect sense, and should not be mocked at all!" It is just part of the absurd method of looking at Silver Age stories that writers like Meltzer continue to this day. Riding giant greyhounds? That's absurd! A costume where the green part is hot while the black part is cold? That's perfectly normal! Wiping super villain's memory of identities? That is so quaint. Android with wind powers? Totally normal! Forgetting how messed up it makes the Atomic Knights world, DC Comics Present #57 is not THAT bad of a story. It has good Alex Saviuk artwork, but man...it really missed the mark in its take on the Atomic Knights. As an added bonus, here are some letters in a later issue of DC Comics Presents, to show you how the issue was received then. Hanging is too good for Dan Mishkin and Gary Cohn! I have always been a fan of the Atomic Knights and you can't imagine how angry I was to pick up DCCP #57 and find out that the fine work of John Broome and Murphy Anderson put into those stories had been reduced to some paranoid super-fantasy of an army brain experiment. Mishkin and Cohn obviously missed the entire point of the Atomic Knights. The idea was not survival of a nuclear holocaust nor to let the military do anything it wants because a few "brave survivors" will get civilization, the phone company and the auto industry running again. What the Atomic Knights meant was the idea that a man could use his imagination to get himself out of trouble when the odds were stacked against him. The atomic war was a backdrop for adventure, in much the same way World War II is a backdrop for the All-Star Squadron. Mishkin and Cohn have taken a fine old science fiction strip and reduced it to nothing with their smug moralizing. At first I was angry at Mishking and Cohn for having the temerity to destroy the legacy of all those dimly remembered stories of the Atomic Knights. But then I began to see some merit to their approach. Even though the atomic war was clearly just a plot device to give some rationale for creating a world in which the Atomic Knights existed, didn't the unreality of the unscarred post-holocaust Earth and the mutant menaces they faced trivialize the terrible after-effects that would really occur? Did it not give a ridiculously false impression of the survivability of a nuclear war and thus become a dangerous and ridiculous misrepresentation on which to base a series? Or is this just a case of paying too much attention to a relatively minor and harmless aspect of a series? Is this a case of two new writers destroying an old mythos just to get one more story out of it? All these questions. Is it a mark of a good, thought-provoking story or of a confusing, ill-advised one? I'm not sure. I suppose Grayle could dream more adventures of the Atomic Knights, but it would not be the same. The magic is gone forever. Of that much, I am sure. Missing the point of classic stories? 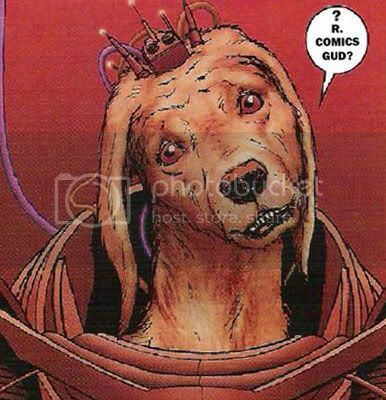 Paying too much attention to minor aspects of comics? So THAT's where that came from!! Good example for an "Update" that instantly becomes a "Downgrade". Do these people totally forget that superheroes ARE fantasy, no matter how "realistic" you try to write them? What ever happened to Suspension of Disbelief? Ha, ironically I just wrote a lengthy rant about cynicism in comics too last night AND used Superman as an example. I used to think that getting people from outside the comics industry was the answer because they wouldn't have the same self-loathing that many adult comics fans that makes them write stories "saving the Silver Age." Meltzer put an end to that theory. Now I think maybe the key is to have people from outside comics who are used to producing all-ages accessible stuff, like Paul Dini, Bruce Timm and Darwyn Cooke who all worked at WB Animation. At the end of the day, these guys had to make entertainment that was Saturday morning friendly and mass-market accessible. We need to get some writers from the Teen Titans cartoon for example and let them go crazy on some all-ages comics. So, how do we save the Silver Age from the guys who tried to save the Silver Age? Here's another question: will the next generation of writers commit themselves to "Saving the Modern Age?" And if so, will that consist of going darker and more cyncical or going more in the all-ages optimistic direction? I like the post. I'm seeing something relatively similar appear all over the web these days. Heck I even wrote something similar. t. - Who knows what the next set of revisionists will do to the current crop of stories? It can go darker and cynical or it can get lighter. Let's not forget that these are pop-culture productions and the current state of things are very dark and cynical everywhere. This fixing of the past is an idea that Jasper Fforde deals with in his book "The Eyre Affair" where there are time cops, etc. In it the history police keep fighting the French Revisionists who go back in time to rewrite it to their liking. Fun stuff. I recommend his books. Still, back on topic. I think what's bothering us is that we're just too aware of what we are reading now. We know the fictional histories of characters, even entire brands as well as the creation process (creative and business sides) so we see how they all connect with each other. Maybe we're a part of the cynicism. I have to agree with the comments about the animators. They've really made some of the best interpretations out there. I'm still plowing through Timm's Batman: The Animated series on DVD. Lovely stuff. As you say, they're good stories on their own. The original stories still exist and can still be read. What's wrong with producing an additional version? It's not like the original is being overwritten (as per the Jasper Fforde analogy). I assume the original stories weren't selling enough (ie. very few were interested in them) to keep them going. Assuming the comic book time matches Real World Time (tm), it was also approaching 1986 - the year of the supposed nuclear holocaust. Strangely, no holocaust happened either in the real world or in the DC universe (of course, Ozymandias managed to save a DC universe with his "alien invasion"). So someone decides to address this and produce a new story using old characters and ideas. If it had been good (and sometimes these things are, honest) then the old characters would've been reinvigorated and everyone would be happy. If not then, well, the original stuff still exists and you don't have to read this new version. The magic is gone forever. Of that much, I am sure. Oh gawd, that is so melodramatic. Get over it. It's not gone. It's still there. Not only that, the whole reinvention could be retconned away in a few years anyway. Or reinvented again with a more "Silver Age" feel to it. Or something. If I had to pick the best "saving" of a Silver Age concept, it's probably what they did to Adam Strange in Swamp Thing. I recently started reading the Adam Strange Archives and even with the knowledge that Sardath's being less than truthful with Adam, the stories still work. What Moore did was add to the concept in a way that didn't violate the original spirit and tone of Fox's stories, IMO. We need to get some writers from the Teen Titans cartoon for example and let them go crazy on some all-ages comics. Ironically enough, the writing stable on the DC Animated stuff includes such people as Marv Wolfman, who apparently aren't good enough to write the original comics anymore. Well yeah, that's the difference between the Moores and Morrisons of our world, and the Meltzers and Winicks. The only ray of hop in DC's current direction is that Morrison is one of the architects, but we'll see how much influence he really has. I usually agree with kelvin, but in this case I disagree about Wolfman, I'm not that crazy about his New Teen Titans comics. I like the cartoon much better. They don't whine and cry as much and can actually win fights. I don't think Wolfman writes that many episodes of the show. "Oh gawd, that is so melodramatic. Get over it. It's not gone. It's still there. Not only that, the whole reinvention could be retconned away in a few years anyway. Or reinvented again with a more "Silver Age" feel to it. Or something." That I do agree with. T.M. Maple's conclusion was too melodramatic. But it was better than another letter that I did not bother to type up in the same letter column that thanked DC, because, in the writer's opinion, this story HAD to be done, because when 1986 came around, what would DC do THEN!?!?!? I posit that that attitude is even worse than some melodrama from good ol' T.M. Maple. The other letterhack was Mark Haden Frazer. Yes, I actually know this. Yes, it's not as if anyone's taken an old silver age character, reinvented them for the '80's, had that character develop further into an original creation only to be canceled, have the name reused on a completely different character, canceled again, and then reinvented as a cardboard version of the original only skinnier and more vapid by a popular but deeply unoriginal writer. This is the second time in a month I've seen DC Comics Presents #57 raked over the coals. It's what I get, I suppose, for entering my name into search engines. Second, I wish people would have more care about ascribing motivations to comics creators they've never spoken to. "Saving the Silver Age" was not a concept that was on the lips or in the brains of anyone involved in that story, and to tell the truth, I don't even understand what the phrase is supposed to mean. I do agree with you that nothing about the Silver Age requires "saving." The origin of the story was that in 1985, Julie Schwartz said to Gary and me, "Write a DC Presents story that explains why World War III doesn't happen in 1986." Julie loved puzzles in stories (and so do I), and this was one that intrigued him. Given Julie's charge, which pretty much had to include making the Atomic Knights series never happen, and given the tenor of the stories of the time, we came up with a story that we all agreed worked quite well and that we thought respected the original. You could argue, and I might agree, that the story shouldn't have been done at all - that the Knights were so much of THEIR time that an eighties sensibility could only damage them. But I was not in the habit of turning down Julie...or a paycheck. BTW, I think the best way to avoid damaging retakes on old and venerable concepts is to create brand new concepts, and that's something I started doing early in my comics writing career. Unfortunately, the people in charge at DC and Marvel always want to squeeze the existing properties for all they're worth - sometimes to good effect, and sometimes to ill - and most superhero fans want to read more Superman/Batman/Spider-Man much more than they want a new superhero. Call it saving, using or abusing, but under these conditions the characters we loved will never be left alone to simply remain the characters we loved. And in my own defense, at least when I altered the Atomic Knights, I did it at the behest of one of the people who created them. Might Spawn Actually Be GOOD?